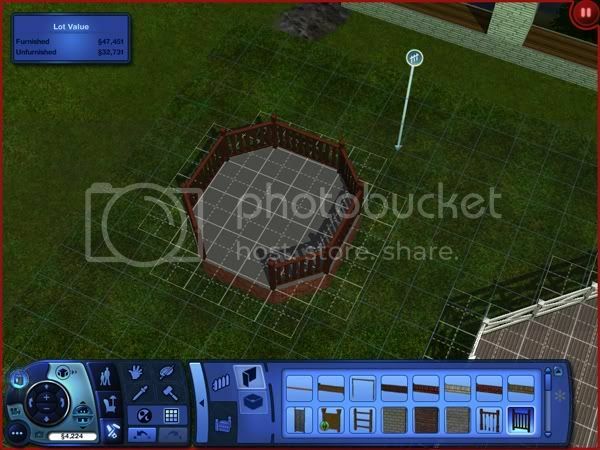 The following tutorial will show you how to build a gazebo and add landscaping to it in The Sims 3. 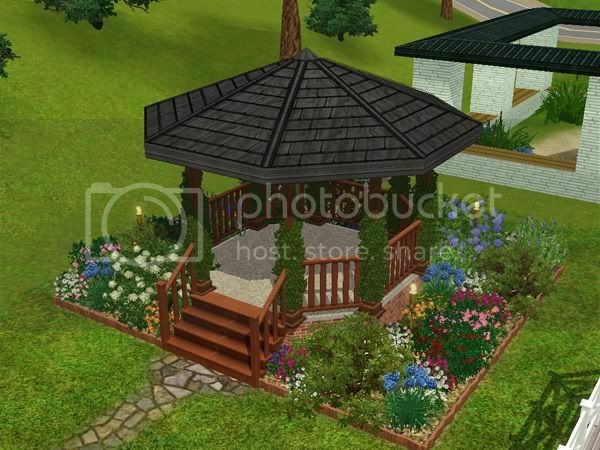 Gazebos are wonderful places for your Sims to relax outside, read a book or chat with their neighbors. 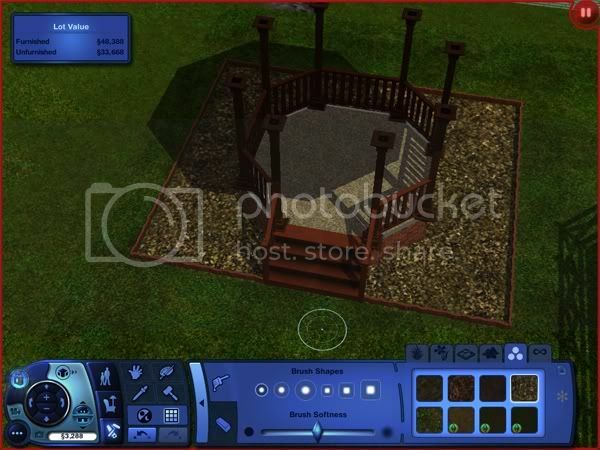 Please keep in mind that this tutorial assumes you have a general knowledge of using Build Mode in The Sims 3. Start your game and go to the neighborhood of your choice. 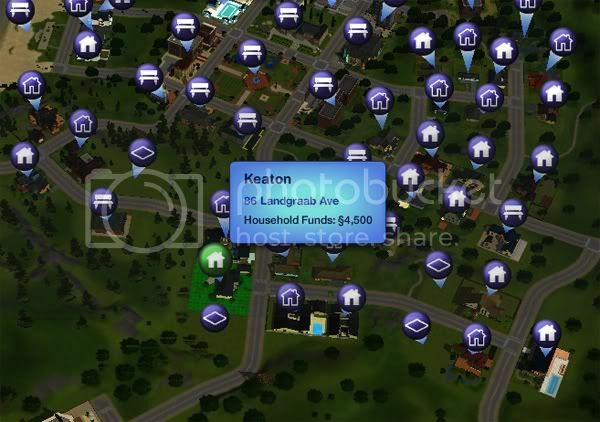 I have chosen to add my gazebo to the back yard of the Keaton family’s house at 86 Landgraab Ave in Sunset Valley. It will take around §4,500 – §5,000 to build, so you might need to add money to the family’s household funds. To do this, open the cheat window by pressing Shift + Ctrl + C. Type in kaching (§1,000) or motherlode (§50,000) and press Enter. First, you will need to remove any landscaping that is around the area that you will be building. You will need at least an 8 x 8 section of tiles, depending on how large you want your gazebo and the surrounding landscaping to be. In Build Mode, go to Platforms, Foundations & Decks. Choose the Foundation tool and create a plus sign. I have made mine 2 x 4 tiles long and 4 x 2 tiles wide. We now need to fill in the plus sign to make it look like a stop sign or octagon. Next, go to Diagonal Platforms, Foundations & Decks and choose the Diagonal Foundation tool. Starting at the outer corner, drag the tool across the empty space and in toward the center of the plus sign. Do this same procedure for all four corners. Now, we need to add fencing around the foundation. Don’t forget to leave space for the stairs! It’s best to be on the first floor level while doing the following steps. Add stairs and the flooring of your choice. The next step will be to put in the columns so we can add a roof to our gazebo. First, go to Roofs and make sure Autoroof is set to off. Next, go to Columns and choose the one that best suits the design of your gazebo. I have chosen the Column Contempo. Place one in each corner like in the screenshot below. Now it’s time to add a roof to our gazebo. Make sure you are on the second floor level. This will allow us to see the grid lines so we can add the roof. Go to Roofs and choose the roof pattern that you would like to use. Next, go to Roof Types and choose the Octagonal Roof. 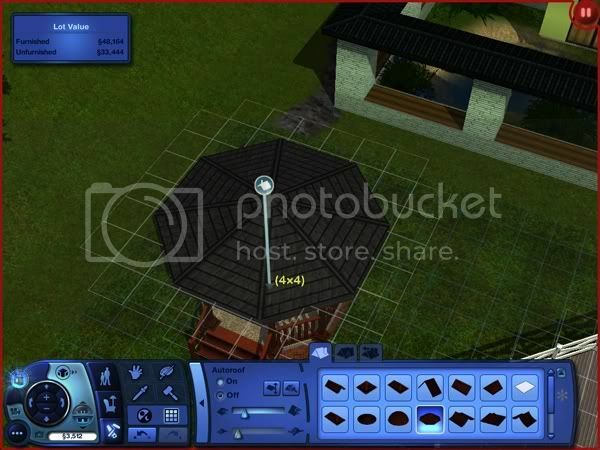 Starting at one of the grid tiles on top of a column, click and drag the roof across to the other side so the roof covers the entire gazebo. You might need to do this a few times to get it perfect. Once you have the roof on, you can then adjust the pitch the way you want it using the Roof Section Pitch Control tool. After the roof is on, we can now add landscaping around the gazebo. Go back down to the first floor or basement level. Go to Fences and choose one that will make a nice border. I have chosen the Taboo Bamboo Fence. 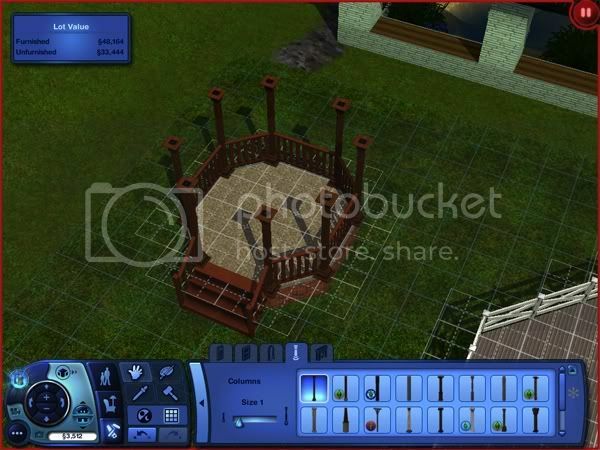 Place the fence at least 2 grid tiles out from the sides of the gazebo, then go to Terrain Paints so we can add some mulch or dirt for the under plants and shrubs for the garden. This gives them a more realistic look. I have chosen the Tanbark Mulch. Now it’s time to add plants and shrubs where we just added the mulch. Choose a variety of colors and place them around the gazebo. I have also chosen to add Evergreen shrubs to the columns. 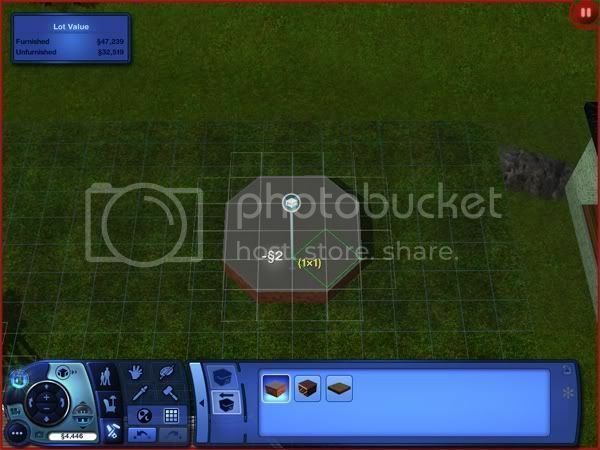 You can use the moveobjects on cheat to move your plants and shrubs to where you want them. 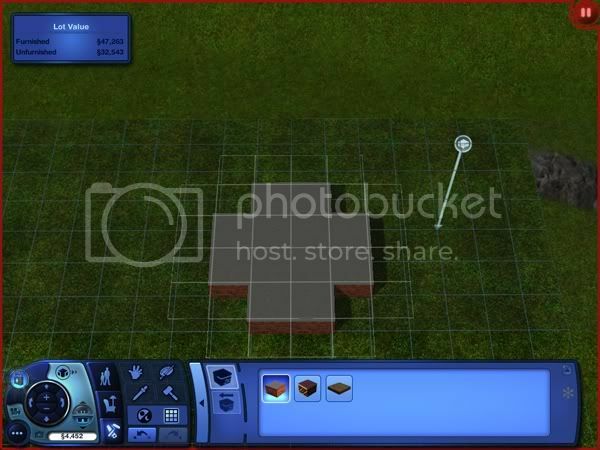 To activate the cheat window, press Shift + Ctrl + C. Type in moveobjects on and press Enter. To move each object, press and hold the Alt button while left-clicking on it once. Move the object to where you want it. To place it, click again. To turn off the cheat, open the cheat window and press the up arrow on your keyboard. Unless you exited the game, moveobjects on should appear. Change on to off and press Enter. Don’t forget to add a pathway so your Sims can get to the gazebo! Of course, they can get there anyway, but it makes it look a little more realistic. You can also add lighting from Buy Mode > Outdoors > Outdoor Lights. Our gazebo is now ready for testing. Add some benches or chairs. 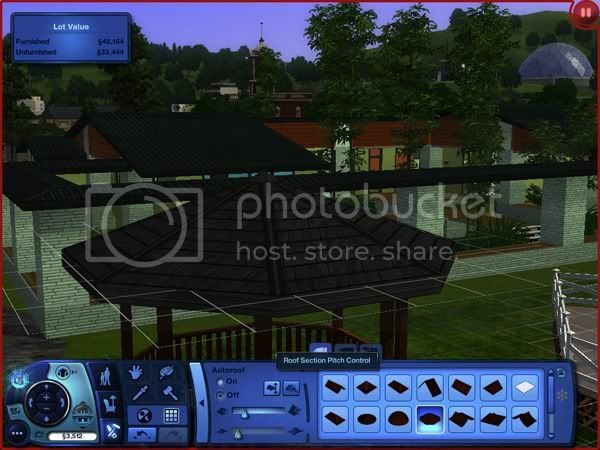 In Live Mode, select a Sim from the household to go sit in the gazebo. Success! It seems the Keaton family really likes their new gazebo. After checking out the new torch lights, Marty decided to join Justine for some relaxation. Right now, in the middle of this weird winter, I'd gladly join them as well, Carrie! Beautiful job!